SOMETIMES LILY: DIY dirt. Kidding, it's a coffee scrub. 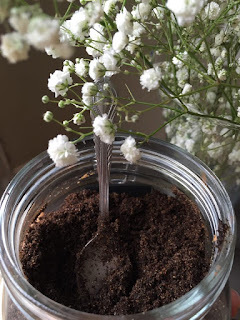 DIY dirt. Kidding, it's a coffee scrub. If you're reading right now and feel like you don't need this ridiculously long post in your life: please. keep. going. Because today's post is not original but is indeed very, very, very useful. I felt the genuine need to share this somehow 'cause I really enjoy reading other's opinions on DIY's. Sometimes Usually, finding a lot of examples first really makes the difference between my trying something or my forgetting it in my long list of bookmarked pages. I think the only important thing to remember in order for this to go smoothly (pun intended) is the consistency of your coconut oil. It should be room temperature (the consistency of petroleum jelly) so that you can easily combine everything. According to the original post, if the oil is in liquid form it would dissolve all of your exfoliants. Of course, if it's in your fridge you'd spend hours just trying to break off a proper chunk to use. The first thing I loved was obviously the smell. If you use un-refined, virgin, coconut oil the smell is absolutely amazing. Add that to the smell of the coffee and you've got me ready to make this stuff in bucketfuls. I spent some time looking up the proper way to use it as well. I wondered if one should scrub dry before a shower or just during. According to some internet sources (very journalistic, I know) doing this dry is the way to go. You could even do some dry brushing before and you'd be extra soft (and extra red fyi). On the Frank Body FAQ page online though, they recommend you do this while damp and leave the scrub on for 5-10 minutes. 1. I did some dry brushing beforehand, simply because I'd been meaning to do it anyway and it seemed like a nice addition so I'd be extra exfoliated. 2. Next, my hair still in a bun, I turned on my shower and dampened my skin completely, not enough that I was dripping wet though. 3. I then grabbed small fistfuls of it at a time and rubbed it all over my body in circular motions. 4. It took long enough to do this that I didn't feel the need to stand there for an extra 5-10 minutes so I only paused for maybe 30 seconds before rinsing it all off after I was completely covered and exfoliated. Et voilá! You are now unbelievably soft.